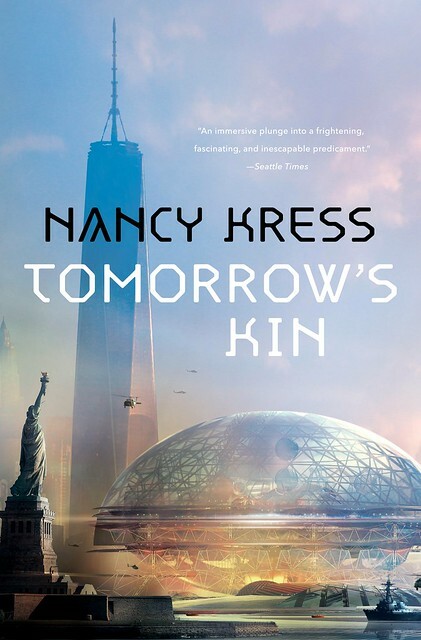 Folks, in discussing her new novel Tomorrow’s Kin, author Nancy Kress has some bad news for you. It’s about your brain. And mine. And everyone’s. 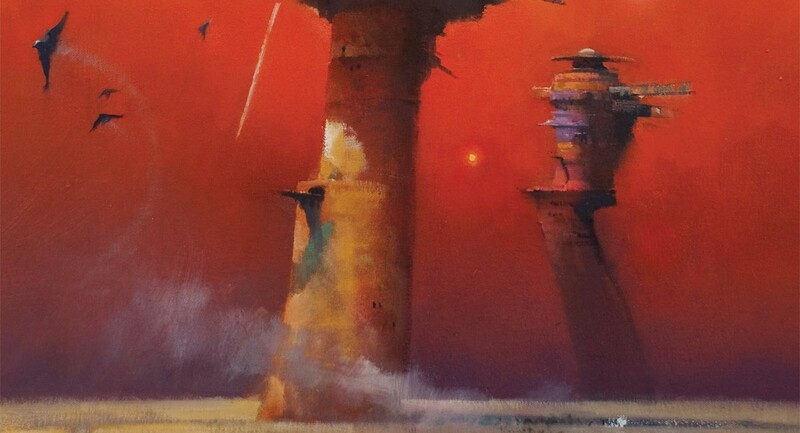 When I set out to extend my novella “Yesterday’s Kin” into the novel Tomorrow’s Kin, which takes the story ten years farther along, I wanted to write about these distortions in your thinking. Oh, not you in particular (how do I know what you’re thinking as you read this—maybe it’s “She doesn’t mean me. I’m different.”) What interested me—especially in the current political climate—is the public mind as it relates to science and the perception of science. There is not, of course, one “public mind.” People have differing perceptions of everything: football vs. soccer, artificial sweetness, lip piercing, Wonder Woman (I loved it). It’s precisely this lack of unity that creates conflict—and conflict is what drives fiction. No one wants to read a 400-page novel in which everything hums sweetly along for the protagonist. For one thing, we’d die of envy. Conflict swarms around science like ants at a picnic. How can this group believe we should spend all that money going to Mars? How can that group be so short-sighted that they don’t see the scientific value of going to Mars? The characters in Tomorrow’s Kin aren’t going to Mars. They are, in a near-future United States, trying to go to a planet its inhabitants call “World.” Before that, they’re trying to deal with two separate global crises on Earth. And nobody can agree on how to perceive those crises, even though—and this is the heart of my novel—scientific evidence makes very clear what are the facts. Fact: The aliens who have shown up on Earth are human, descendants of Homo sapiens taken from Terra 140,000 years ago. DNA and tissue analysis confirm this. Many people nonetheless believe that Worlders are the ultimate “other,” a separate invasive species up to no good who should be treated like Burmese pythons in the Everglades. Fact: The spore cloud that Worlders say is drifting toward Earth exists. Astronomers confirm this, once they know where to look. Worlders say it is carrying a deadly pathogen that has already wiped out two of their own space colonies. Many people prefer to believe there is no cloud and the Worlders are planning to infect Earth with a plague. Fact: In return for our help, Worlders leave us with the science and the engineering to build starships. Scientists eagerly decipher these and construction begins by both private entrepreneurs and several governments. Many people regard this as a Trojan horse from a race bent on destroying us. Fact: When the spore cloud arrives, it has unexpected and terrible ecological consequences on Earth. Many people regard this as the Worlders’ fault because the epidemic arrived just after the Worlders left, even though correlation is not the same as causation. But humanity has a long history of shooting the messenger, as well as of denying scientific fact. The medieval Church preferred the lovely idea that the Earth is the center of the universe to Galileo’s fact that it revolves around the sun. Much of the nineteenth century preferred a 6,000-year-old Earth to Darwin’s unsettling notions about evolution. Current oil-company CEOs prefer to believe that humanity is not causing global warming. And several prominent basketball players have announced their belief that the Earth is flat. Do you believe something not because of fact but because of confirmation bias, presentism, scapegoating, emotionalism, polarization, or a need for control? No? So are the characters in Tomorrow’s Kin. For a while, anyway. 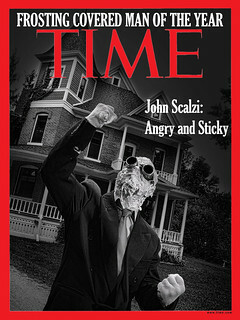 Dammit Scalzi, I was trying to not buy books for a while. Instead I find 2 new books for the Scalzi Big Idea memorial bookshelf. As a scientist, this sounds fascinating. I loved this Big Idea piece–immediately purchased the kindle edition. 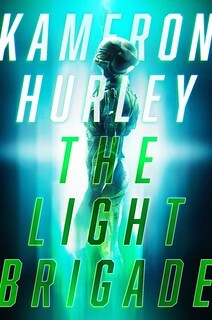 I really enjoyed the novella and will be interested to check out this follow-up! Couple of corrections at the end: There are many people, especially in the US who still believe the Earth is only 6-10,000 years old and that evolution is a lie and the suppression of Galilieo had as much to do with politics and Galilieo’s abrasive personality as scientific ignorance. Sounds really good. I immediately got the novella and will move on from there. How timely! I don’t want to admit how squee I squee’d when I saw there’s a new Nancy Kress book out.